Six months on from the flood of 22 August 2017, there is a palpable sense of anger and fear among victims who say they have been largely forgotten and warn that further flooding could happen at anytime. Taoiseach Leo Varadkar, Minister Joe McHugh and Minister Regina Doherty and officials from Donegal County Council visiting Inishowen last August. Flood victims say government hasn’t followed through with its promises of help. Many remain out of their homes, juggling mortgage repayments with additional rent payments, while businesses have struggled to recoup losses incurred. Some have received compensation payouts, while others are still negotiating with their insurance companies. However insurers are refusing to cover homes or businesses against future flood or storm damage. Many are extremely anxious that another catastrophe could be imminent, particularly as heavy rainfall threatens to cause further floods. They are furious that not enough has been done in terms of managing the risk on our rivers. “There is a huge fear, particularly every time there is a heavy downpour,” says Maria Hegarty, whose Carn business was flooded. Those affected praised the community fundraising response but say the State follow-up has been entirely inadequate. “TDs and other politicians came and promised that they would do everything in their power to help but they never followed-up on those promises. 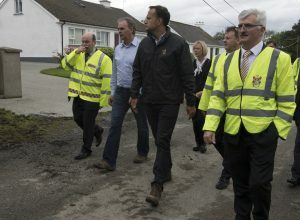 I never heard from them again,” says local mechanic Willie Smyth, who sustained an estimated €250,000 in flood damage. Burnfoot man Darren Donaghey spent more than three months living in hotels and describes the past six months as a “total nightmare”. He needs an estimated €30,000 to repair his flooded bungalow, which remains in ruins today just as it was six months ago. Buncrana grandmother Winnie O’Neill, who is also still out of her flooded home, says people here are suffering from post-traumatic stress. For more coverage on the Inishowen flood 6 months on, see today’s Inishowen Independent.